And it’s a wrap! September has finally come, so let’s have a quick recap of all the good things that happened this spring and summer. First of all, we received some well-deserved accolades which made us extremely proud as we really work hard all the time to additionally improve Autoklose. G2 Crowd honored us with the “High Performer” award this spring for being among the top software companies in Sales Intelligence Software and Email Tracking Software, and we also earned their “Users Love Us” badge which is based on real-user experiences. 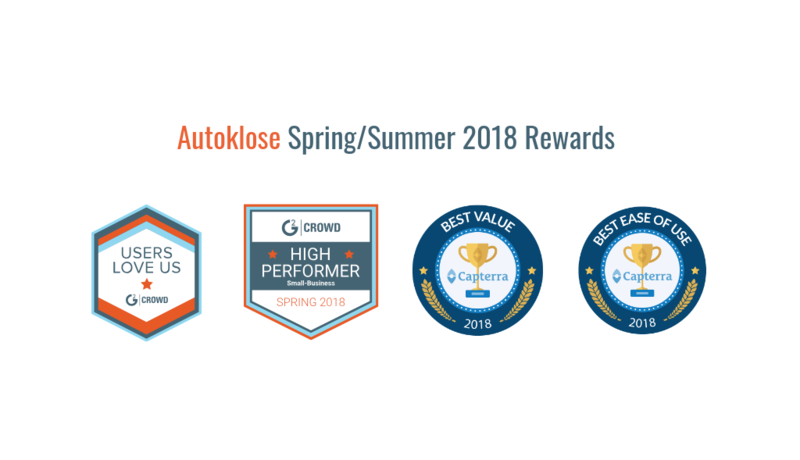 Autoklose also scored a double win at Capterra Awards 2018, and received the “Best Value” and “Best Ease of Use” badges for Email Tracking, Lead Generation and Sales Force Automation Features. Zapier integration was the first in line. Zapier lets you connect Autoklose with 1,000+ other web tools! Read more about this major update in a separate blog post. A series of new ready-to-use sales email templates was added. To download even more high-converting sales email templates, check out our recent blog post on the topic. Our database expanded, which means that database subscribers can access 3 million clean and verified contacts. Email threading is now possible thus allowing you to see the whole correspondence with a recipient as a single thread. Push notifications which will significantly improve your overall deliverability by instantly detecting your Google account replies were added. It’s now possible to edit your email templates and combine them as you wish before launching a campaign. Email reordering allows you to change the order of emails in a sequence even after you start a campaign. To prevent you from sending the same email twice in an active campaign, the “Reordering warning message” was introduced and it will remind you to double-check everything before hitting the save changes button. You can now add attachments to your templates and they will be saved together with the template. With autosave notifications, you will never have to worry about losing your important work while you’re making changes to templates. The “Unsubscribe link” button was added in case that you want to make it as easy as possible for your customers to let you know that they no longer want to receive your emails. We still don’t think that there’s a reason to use this option in a personalized and highly tailored communication, but in case that you decide to do so, you have that option now. The export function for recipients in the campaign was expanded, which means that you can take advantage of valuable data points and important stats for each and every recipient in a campaign. GoVideo by Vidyard is another super cool, easy-to-use feature we implemented in order to allow you to record, edit, and upload videos directly from the template, without having to leave the platform. Sign up for a 14-day free trial to use video prospecting! 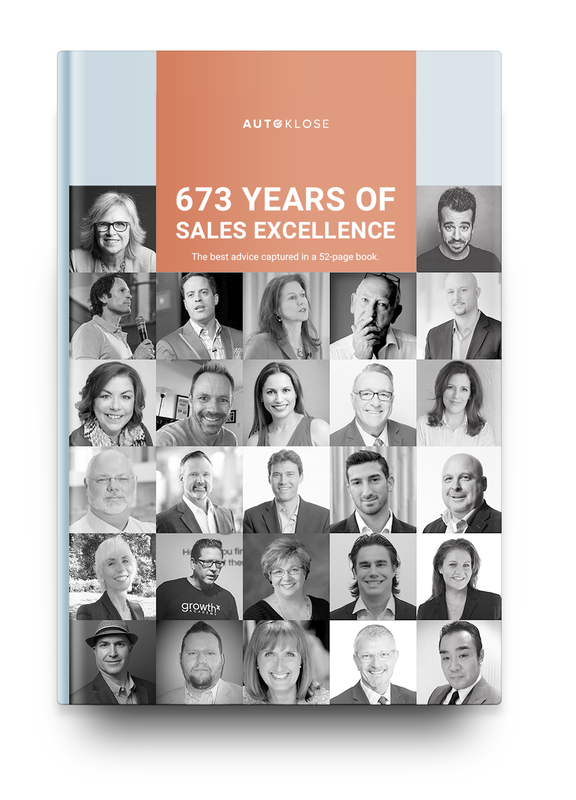 Let’s not forget our joint effort with some of the best sales leaders out there to bring you 673 Years of Sales Excellence, an e-book brimming with practical and valuable sales advice that you can actually implement and benefit from. Also, Shawn Finder, CEO of Autoklose, hosted a webinar 7 Tips for Using LinkedIn for Lead Gen, and if you failed to attend it, here’s the recording so that you can catch up with the latest trends. The fall ahead of us will be busier than ever, and you can expect even more new features, upgrades, and webinars which will help you take your sales to the next level.